What we’re actually talking about is getting useful informational content (as opposed to promotional messages) to our target audience in the expectation that enough will engage sufficiently to recognise us in future and hopefully come back for more and, praise be, be converted to our products/services. If you’re thinking about social media in your law firm, what you’re really thinking about (or ought to be thinking about) is content marketing. Create good, legitimate, practical, reader-oriented content. When you’ve done that, go back and create more. Then more again. Don’t even think about designing a blog, opening a Twitter account, starting up a Facebook page, whatever, until you’ve figured out very clearly what content you’re creating, why you’re creating it, and who you want to reach with it. A blog post is an example of content marketing. It’s no different from a live presentation, a media interview, or a newsletter article. 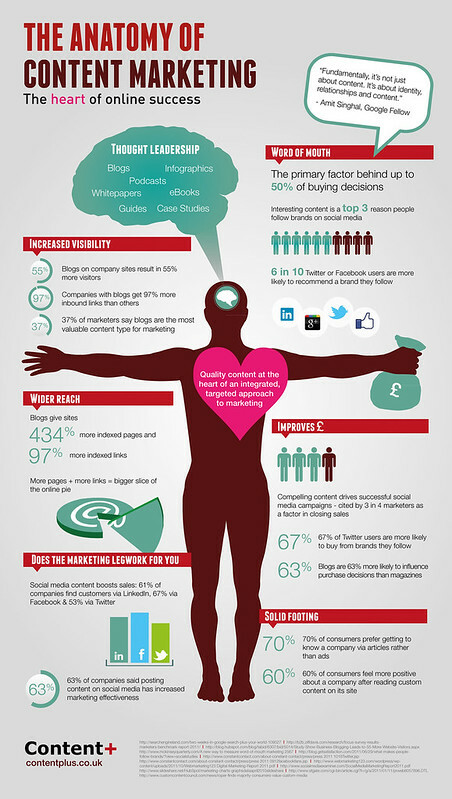 Either you think content marketing is worthwhile, or you don’t. If you don’t, pay no attention to blogs. If you do, please be assured, really and truly, that there’s nothing unusual or problematic about them. generating links and boosting traffic to your website. You’ll note that two of the three bullets relate to search engine optimisation and that’s certainly central to Sue’s advice. If you use a content management system like WordPress (or Blogger etc) to publish content (whether it’s a blog, a newsletter or some other type of update site), you have – to an extent – built in SEO. Of course, there’s much more to content marketing than using the right sort of publishing platform. It’s what you write (the content) and how you support and promote it (the media) that will make the difference. Where is all this content marketing going on? (follow new additions in the More Blawgs feed in the sidebar). If not blogs, then surely many firms are publishing newsletter-type content? After all almost all websites are now published using content management systems, and all CMS will incorporate most recent-first publishing templates appropriate for blogs/newsletters/articles/updates; so implementing the publishing mechanics is not the issue. There must be many competent and effective if unremarkable efforts, but sadly, for some, basic competence is the issue. Intelligent, well-thought out and reasoned blogs are great trust influencers – essential for a legal website. As you state above, if you are going to “do” content marketing – “do” it! And consistently. Too easily is that hard earned trust lost when the visitor discovers that no new blog post has been created in weeks. I’m surprised more firms don’t focus on newsletters / email marketing a little more. I can’t remember the last time I saw an email capture form on the website of a law firm similar to the style you see on some internet marketing websites. I’m sure there are some, they’re just not as common as you’d expect. Using them, firms would have a great way to show their new content to individuals and companies who have already expressed an interest in their site by subscribing in the first place. Not only could this result in SEO benefits from linking, but also bring in more business for the firm. I digitised a Top 30 firm from top to bottom. 7 services lines, 1300 staff and a shed load of newsletters. The best ‘open rate’ we ever had was 7%. The CTR was even worse. The unsubscribe rate was through the roof – although there was an insistence from Heads of Dept that “our clients tell us all the time that they love our newsletters”! Content is difficult to produce on an ongoing and consistent basis. Many firms now are ramping up and hiring professional support lawyers and ex-journos who can create material.